Home » Crafts and DIY » Crafts » DIY Tic Tac Toe Game Board: A Simple Gift for Only Pennies! Many years ago, I was in charge of the environmental club at my kid’s elementary school. When Earth Day rolled around, we wanted to give each of them a small token to celebrate a day we all worked so hard to support. But, of course, we had no budget for gifts and didn’t want to get useless plastic stuff that would totally go against the ‘green and eco friendly’ message we were trying to spread. We finally found a seed company to donate packages of seeds to us but boy do I wish I had come across this DIY tic tac toe game board back then! 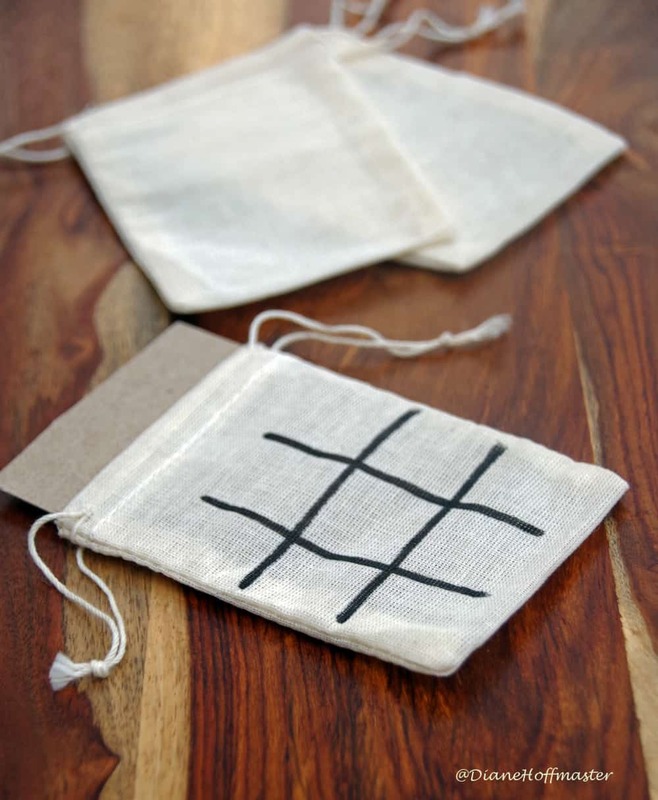 This homemade tic tac toe game takes only minutes to make. The pieces themselves tuck easily inside the cloth bag for traveling. Keep it in your car or purse for those times your kids have to wait patiently. This diy tic tac toe game board keeps your game pieces securely stowed away so they don’t get lost. 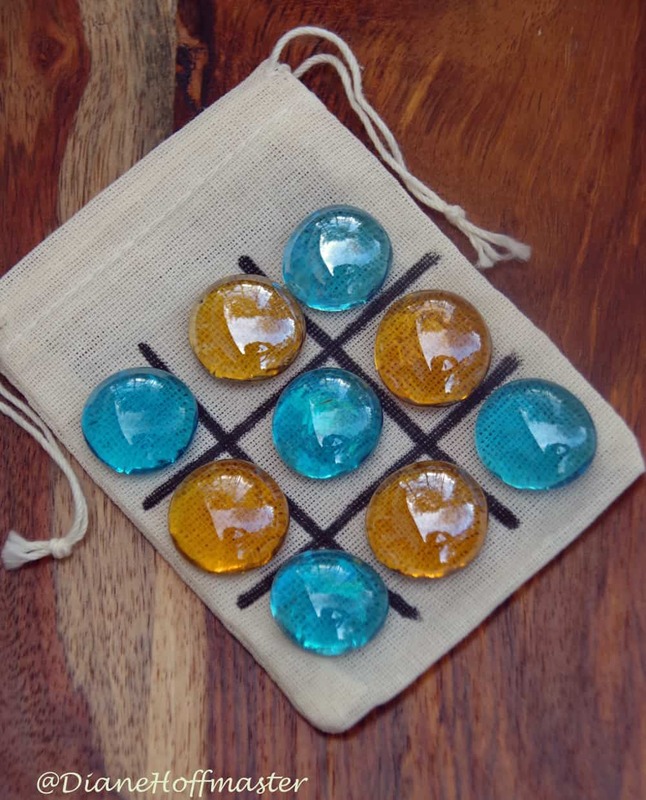 One tiny little muslin tea bag, a black paint marker, and a few colored glass stones or marbles are all you need to create a tic tac toe game that can go anywhere with you. Handy to keep in the car or at grandma’s house for some easy entertainment. Ever have to come up with a gift for lots of kids on a really strict budget? Holiday party at school, maybe? Or a child’s birthday party at your home and you need ‘goody bag stuffers’ that don’t cost a fortune? Making this DIY tic tac toe game board takes only seconds and you can customize it for your child in many ways. Paint the stones their favorite color or draw hearts on the stones for Valentine’s Day. There are many variations you can make, depending on how creative you are. If you use a slightly larger bag, you can use milk jug lids or bottle caps as your tic tac toe markers. You can also cut a wine cork into small circles and use those. The great thing about this DIY tic tac toe game board is that if it gets lost you are only out a few pennies! 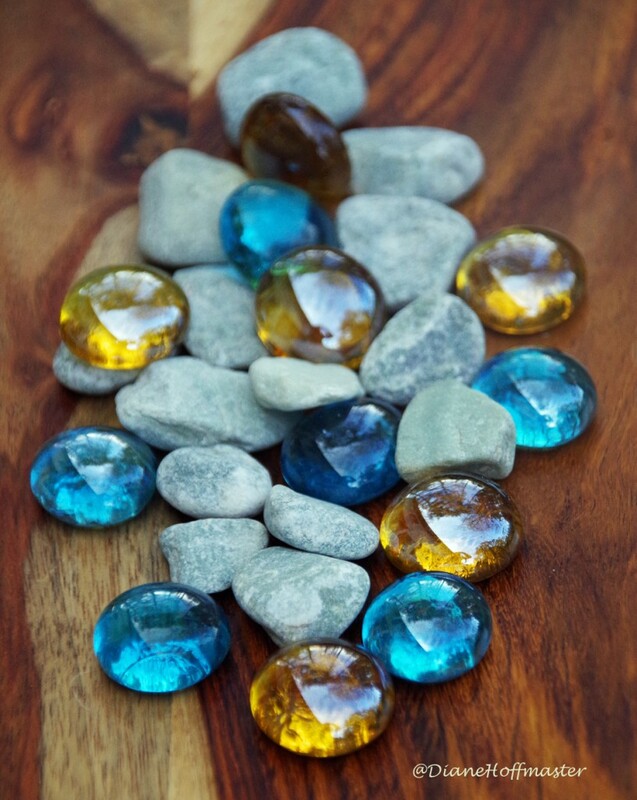 Glass gems, assorted colors. You can also use rocks, bottle caps, etc. Store game pieces in the bag with the drawstring drawn tight. For directions on how to play tic tac toe go over to WikiHow! 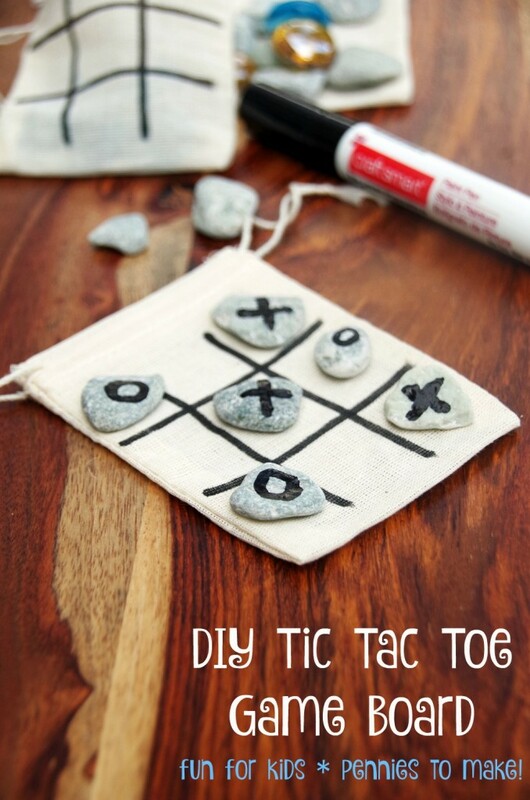 You can make your own tic tac toe game out of so many things around your home! Upcycle bottle caps or go out on a nature walk and collect acorns. Then, just make your DIY tic tac toe grid and start playing! Do you enjoy playing tic tac toe with your kids? Love this idea? 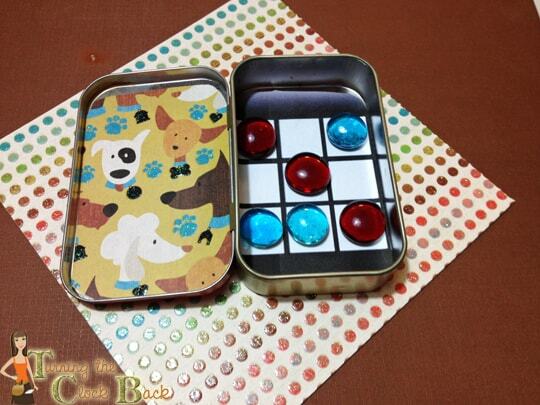 Try making this easy tic tac toe game board from an Altoid tin!